Online ordering will be available through this website soon, but we’re bringing some bottles with us to Imaginarium this weekend! Only $8 per vial. You’ll find it at the table I’m sharing with John F. Allen, who is premiering his exclusive God Killers colors you can read about here! Each batch is hand-mixed and completely non-toxic, created and offered exclusively by Akira Lacquer. 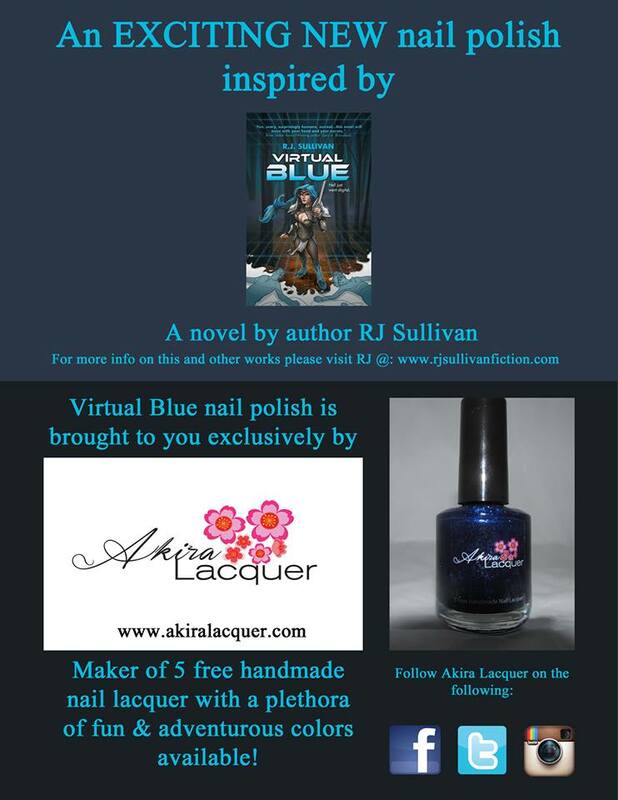 Virtual Blue Nail Polish: kickass color for punkgeeks and geekpunks everywhere, and the answer to the burning question: what does R.J. Sullivan offer that Stephen King doesn’t? Come by and grab your bottle this weekend! Tomorrow: I’m posting all the details on how to stalk R.J. during Imaginarium weekend! This entry was posted in Uncategorized and tagged akira lacquer, Blue Series, Blue Shaefer, Book Promotion, book signing, John F. Allen, nail polish, paranormal thriller, R.J. Sullivan, Rebecca Burton, seventh star press, Virtual Blue. Bookmark the permalink. Can i just say this is the most UBER amazing, AWESOME thing I have ever heard of ??????????? ?